Back in 1991, Bobcat Goldthwait wrote, directed and starred in a movie that some critics called the worst of all time. Shakes the Clown was made on a modest budget of $1.5 million and grossed $115,000 in theaters. It was called a complete waste of time by many…but also “the Citizen Kane of alcoholic clown movies” by one. On Sunday afternoon, along with a few original cast members from the film and many of his friends old and new to round out the cast, Goldthwait took to Cobb’s Comedy Club’s stage for a live reading of the movie. *-Reprised their roles from the original film. My wife and I had never seen the movie. We went to the event to see Bobcat, Florence Henderson and Julie Brown. The reading was terrific. With sixteen actors in total, Goldthwait and company were able to take a transcript of the film done by a Spanish subtitles technician and stage directions scribbled in the night before, and put on a show that was descriptive enough that you were never lost, and had enough different actors that you always knew who was speaking. Bobcat was genuinely moved by the turnout the movie that bombed in 1991 got at the event. He loved the crowd response so much that he asked if they could do an unplanned Q&A afterward. During the Q&A, his juggle double from the film revealed himself as just another paying attendee in the crowd. Local clowns asked the cast if they clowned in their spare time, and if they would like to clown with them. The cast told stories about the film, and continued to soak in the cheers and joy from the fans that attended. After the Q&A, the venue tried to get everyone to leave, but Bobcat and Julie stayed and took photos and signed autographs. It was a great event, and an excellent way to cap off a wonderful three weeks of Sketchfest activity. All told, I would rank BriTANicK first, Shakes the Clown second, and Michael Winslow third in an epic Sketchfest run. We got to see twelve shows, many at places we had never been before. 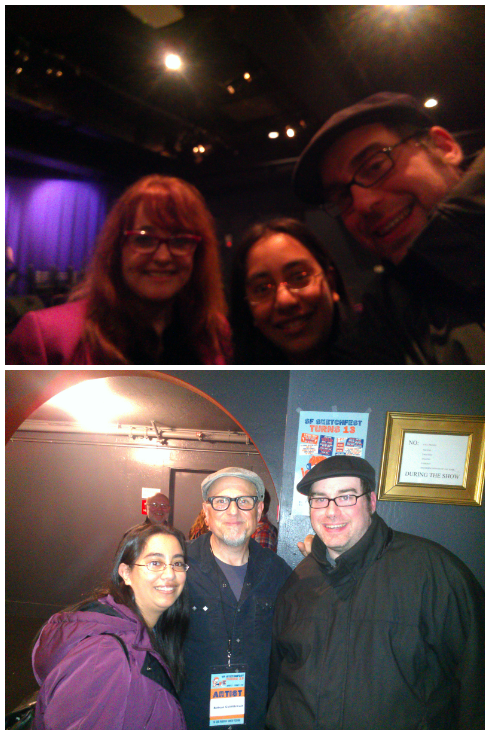 We got to meet Nellie Mckay, BriTANicK, Stephen Tobolowsky, Gilbert Gottfried, Julie Brown and Bobcat Goldthwait. But the weekend wasn’t quite over yet. February 10, 2014 in Event.